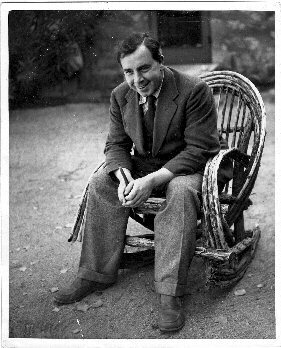 Yorkshire inspired J.B. Priestley’s best writing, but he also loved Arizona. This week we visit his writing hut at the Remuda Ranch in Wickenburg. The hut was less than 12 feet by 10, made of unpainted boards, and contained very little: a table with his typewriter, some books and tobacco things on shelves, and a small tin stove. 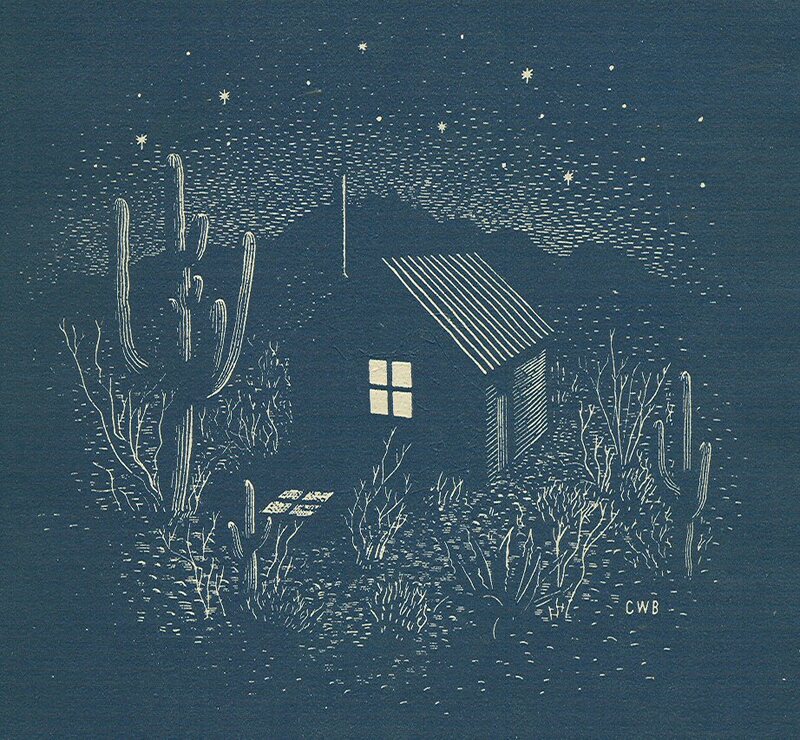 J.B. Priestley’s writing hut in Arizona, amongst cacti, hills and stars. Detail from front of dustjacket Midnight on the Desert, Heinemann, 1937. Priestley first saw Arizona in 1934, when he was sent by Ealing Studios to investigate the possibilities of a film for Gracie Fields. He fell in love with the landscape, “the clear bright winter mornings and the blaze of stars at midnight, the glittering desert floor with its promise of precious stones, the hillside of giant saguaros, the amethyst peaks and the red-gold fortresses of rock, and, not least, the air so pure, it seems magical”. 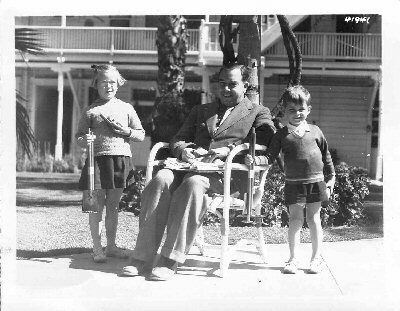 J.B. Priestley in a rocking chair, Wickenburg, Arizona, about 1936. Photographer unknown. Archive ref: PRI 21/5/7. 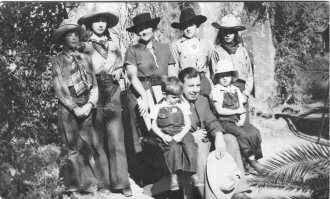 Priestley, his wife Jane and their children spent two winters at the Ranch during the late 1930s, the dry climate being better for Jane’s health. The family remembered these as times of fun and freedom, though Priestley himself continued to write, to work on US productions of his plays, and to give lectures. The Priestley family dressed as cowboys, Arizona, 1936. Photographer unknown. Archive ref: PRI 21/5/5. Priestley wrote most memorably about Arizona in Midnight on the Desert (1937). In this, and its 1939 companion Rain upon Godshill, Priestley created a kind of descriptive autobiography, “packing reminiscence and discourse into a long reverie”. This format suited his ability to write engagingly about his own experiences, whether being comically grumpy about the inconveniences of travel, sharing profound emotions, or exploring ideas. He gave the two narratives shape by beginning and ending “at a certain time in a definite place” and concentrating on the “events, opinions, thoughts” of the previous year or so. In Midnight Priestley is writing in London on a dark, wet Monday, but his mind is back in Arizona, one late night in the hut towards the end of his stay. He was having a clear-out, burning in the little stove an “accumulated litter of letters and odd papers” and chapters of writing that he felt had failed. He reflects on this visit to the United States, and, with frequent returns to his sorting in the hut, tells us about his travels and his thoughts, sharing his views on the state of publishing, his experience of journalists in the USA, memories of his father Jonathan, Hollywood, giving lectures, American railways and much more. Above all, he ponders the great mysteries of human consciousness and of time. As we have already seen, he had just discovered and been thrilled by the possibilities of the writings of Dunne and Ouspensky and they were much on his mind that year. Priestley shares his sense of wonder and revelation as he looks at the Canyon – the changing weathers, the sheer scale, the colours. Above all he feels it gave a view of deep time, a fourth dimension to the landscape. Priestley realises that he dreamed of the Canyon long ago: maybe that dreaming self had made some Ouspenskian connection with the self now seeing the Canyon. Midnight ends with Priestley finishing his work in the hut to go out into the cold starlit winter night. He is sorry to leave Arizona but he knows he can always recapture a place through his imagination, be in London in Arizona or Arizona in London: “I must try to put some of this in a book …”. Which he did! Note on sources. The long quotation in the second paragraph is from an article, “Arizona Revisited” (archive ref PRI 5/7/7: we think it was published in Travel & Leisure Magazine 1974). Other quotations are from Midnight itself, Margin Released, and Instead of the Trees. The latter, published in 1977, was a very belated finale to the trilogy of descriptive autobiographies. The Priestley Companion includes several key pieces from Midnight, including the first part of The Grand Canyon, and is probably easier to get hold of through libraries. In his 1962 memoir, Margin Released, J.B. Priestley looked back to his teens in Bradford, when he worked as a junior clerk with Helm and Company in the Swan Arcade (now sadly demolished). In his spare time, he was “a lad bent on writing”, “scribbling and scribbling away” in what Priestley calls his scribbling books, notebooks he made at work in the copying press when no-one was looking. Some of his works were typed up for him, by a “soft-hearted” girl who had her own typing agency near his office. In 1913 he began to find his way into print. For most of the year he wrote a cultural column, “Round the Hearth”, for Labour weekly newspaper The Bradford Pioneer. This work was unpaid. But later that year an imaginary interview, “Secrets of the Ragtime King”, was accepted by a weekly magazine, London Opinion: payment, one guinea. A version of the piece shown above, “The Modern Juggernaut”, appeared in The Labour Leader. Priestley did not hoard paperwork, but somehow a box file containing scribbling books and typescripts survived to inspire him when writing Margin Released. Two scribbling books and the typescripts are now in the J.B. Priestley Archive, along with issues of The Bradford Pioneer. This image shows how fragile the surviving volumes are. 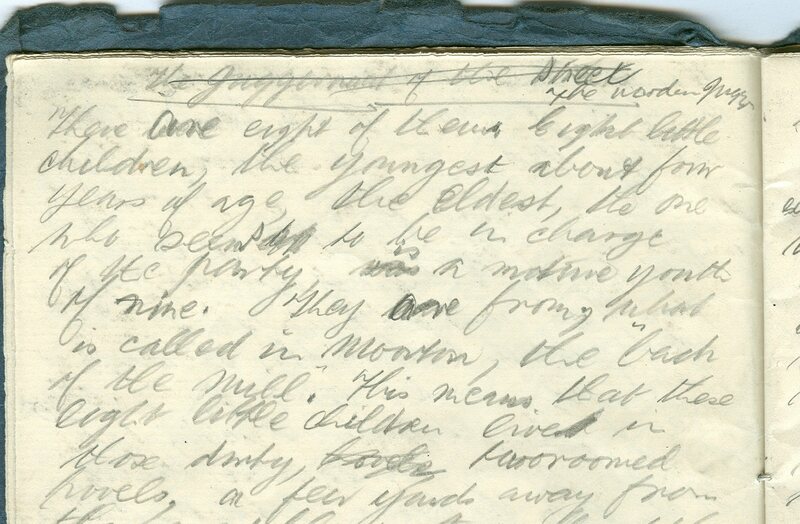 The hand-writing is “dark with closely-pencilled lines” and often smudged. 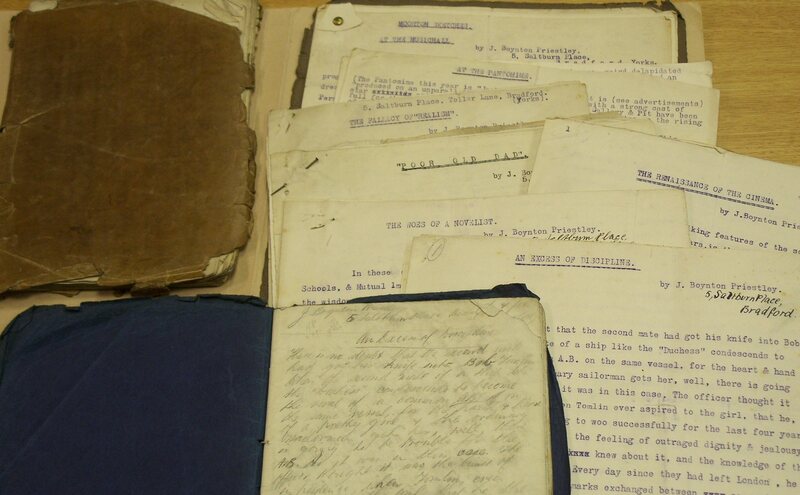 Transcripts of some of these early works, with critical commentary by John F. Bennett, appear in recent issues of the J.B. Priestley Society Journal. In the memoir, Priestley was scathing about his early writing. “Even as teenage efforts they seem to me to have hardly any merit”, he wrote of three short stories. I think he was rather hard on himself. The young Priestley was a beginner, experimenting with forms and styles, and was persistent enough to finish works and get them published. It is exciting to see him finding the topics that were to interest him later: the value of the arts, popular culture, especially the music-hall, the impact of mechanisation and the mass media on people’s lives.